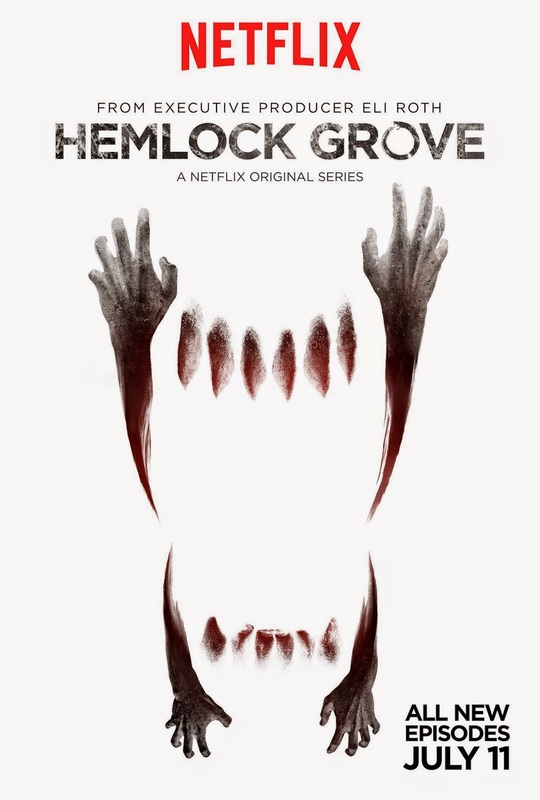 "Hemlock Grove" is returning to Netlfix this July for a second seas, and if the new poster art is any indication, it's going to pack a big bite. This season, new showrunner Charles "Chic" Eglee ("The Walking Dead," "Dexter") takes over for the werewolfy show starring Famke Janssen, Bill Skarsgård, Landon Liboiron and Dougray Scott. According to Netflix, this is what fans can expect this July, 11. "Season Two continues with the town coming to grips with the shocking massacre incurred by one of its deadliest creatures. Roman and Peter are now faced with new responsibilities and the realities that come with adulthood. Roman’s relationship with his mother (Janssen) is all but dead as he struggles with his unwanted Upir birthright and the disappearance of his sister, Shelley (Martin). Peter moves in with Destiny (Horn) and is forced to get a job after his mother is sent away. Meanwhile, in search of a new life, newcomer Miranda Cates (Brewer) embarks on Hemlock Grove with an unknowingly profound effect on Peter and Roman. And Norman (Scott), still reeling from the loss of his family, must face the harsh truths that are uncovered about those he still loves."